Documenting a trip makes for a great keepsake, but it can also be a powerful tool for self-reflection, turning any journey into a spiritual one. In this article, we share 5 tips on how to journal while travelling. How will you remember your travels? As a blur or as a vision? 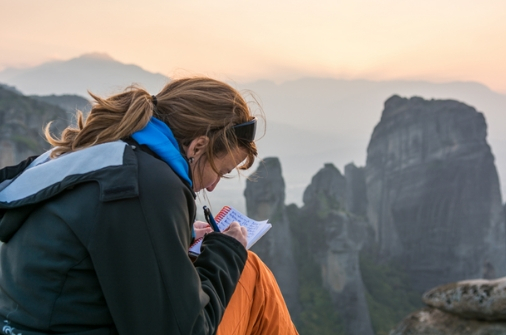 In this blog, we share 5 tips to make a meaningful travel journal. That moment, according to the article, was when L’Engle realized that she had to keep writing for herself, even if she never successfully published another book again. And so, she began anew. Nevertheless, she persisted, and “A Wrinkle in Time” went on to become the bestselling phenomenon that it is today. I wonder where you are tonight. Have your to-do lists gotten out of hand? Could they easily be mistaken for a short novel? Hey, friend, I’m not judging. I get it. To-do lists keep us focused, right? They keep us moving in a forward direction. Or, do they? For several years, I took pride in having a long to-do list because it meant I was setting goals. As a writer of several fiction books, I always have some project that I’m in the middle of, another project that I’m just beginning, and a crazy amount of marketing that always needs to be done. What do you do when you can’t seem to find your voice but you gotta get it out? One of my favorite ways to move energy when I feel stuck is to write and burn. It’s not like you just write and burn and it’s done… it truly is a healing process. You may have heard of Julia Cameron’s “Morning Pages” ritual that invites you to journal stream of consciousness thoughts for ten minutes each morning. It’s a great way to get the funk and the junk out of your subconscious so you are more capable of being creative, intentional and free. Write and Burn, is similar, but different. It invites you to get honest with the feelings that don’t feel good … so honest that you are willing to move them out of your head and heart and onto paper. It is an extremely powerful process that I have been doing for years. I find it so helpful that I suggest it to about 90% of my clients at one time or another. Writing to heal is scientifically proven. I knew I always felt better after I had written in my journal, especially the painful yucky stuff, but I didn’t know there was “real” science that backed up what I felt. Not until I read an article about James W. Pennebaker, a psychology professor. He became deeply interested in the physical and mental benefits of what he called self-disclosure and created an experiment to test out his theory. He gathered a group of students who were asked to write about their own traumatic experiences for 20 minutes, on three consecutive days. Serving as a control group were an equal number of students asked to write about unimportant matters. The results showed that there was a marked difference between the two groups in terms of the impact of the writing exercise. In those who had written of trivial matters, there was no change either in their physical or mental health. In contrast, those who had written about traumatic experiences showed a marked strengthening of their immune system, decreased visits to the doctor and significant increases in psychological well-being. These findings were measured using physiological markers, behavioral markers and self-reporting. In another study in the 1990s of people with AIDS, those who wrote about their diagnosis and how it had affected their lives experienced a beneficial increase in white blood cell counts and a drop in their viral loads. Writing & Burning is a safe place for you to release. It’s a place for you to get honest with yourself and your pain. A place for you to allow yourself complete freedom to write whatever you want. No one else but you will ever see it, so swear and curse if you feel the need and write down everything that you feel about the person or the situation that is affecting you. Write about why you feel the way you do … even if it doesn’t make sense. There are a lot of things that my guru Maharajji said to me in the small amount of time I was with him. I had been with him from November, 1967 to March, 1968. “With him” means I was in a temple to which he was connected. I’d estimate I saw him a total of four hours in that time span. Out of that time came “Be Here Now,” because he was involved in it very clearly. There was a moment in 1968 when Hari Dass, who was the teacher that Maharajji had given me, came to my room, and he was silent. He wrote on his slate, “Babaji has just given his ashirvad for your book.” I said, “What does ashirvad mean?” and he said, “Blessing.” What book was he talking about? I had no idea, so when I left India and came home, and started to live like a yogi in New Hampshire, I didn’t know what to do with my time. You discover your purpose by being present in the moment. Listening to your inner guidance. Paying attention to the messages you are receiving at any given time. Being aware of the feelings in your body when certain things awaken a desire within us. And being absolutely mindful of our thoughts. If purpose is within us, and you desire to discover consciously what your purpose is, then we must understand that spirit speaks to you in present moment. You cannot hear the message from spirit when thinking about the past or thinking about the future. Spirit speaks to you in present moment. It is a now experience. This exercise can be done at any particular time when you are in need of clarity or guidance. Your purpose is constantly changing as you change and grow and expand. So, this exercise may be helpful at any given time along your journey of life. Automatic writing will help you to be conscious of what is calling to you at this particular time in your life so that you can live intentionally and consciously. In many ways, writing is listening and simply taking notes. One of the reasons I love the process of writing is that it enables me to listen until my loneliness opens into a blessed sense of aloneness. The gift of deep silence is that it allows us to let go of what we want so we can receive what we have. I’ve always been a learner of the heart, not a specialist of the mind. I can dissect and hone and prune away the excess. But the shimmer of Wholeness and the dynamics of Oneness show themselves when we can absorb and integrate rather than sort and choose. As a young writer, I would try so hard to be a mirror, to reflect back to everything its color and verve. But as a more experienced writer, I try to be a window now, to open a threshold between people and the inner world. Being still and listening allows us to behold what is before us. The deepest form of bearing witness is to behold another in all their innocence. This is the key to love. To listen until the noise of the world subsides. To listen until the noise of the mind subsides. To listen until the noise of our wounds subsides. To listen until we only hear the life before us. Do you know that paying attention to and tapping into the power of synchronicity is a way to hone in on your partnership with the Universe and create your destiny? I know it appears I’m repeating myself as I have written about this many times in the past because it’s so important to underline especially these days. With all the turmoil in the world, it’s easy to only believe what appears to be true in that crazy environment where the media reports only the drama and very little of the amazing and good. We are in a time of great change and if we rely on only what we see and are exposed to we will only be responding to a sliver of the whole story. It’s easy to get stuck in the challenges. Yet there is a guiding principle that engages us through meaningful coincidences that Swiss psychologist Carl Jung called synchronicity. No matter the temporary conditions, your intentions and energy are reflected through this invisible guidance. It’s kind of like the universe working anonymously on your behalf. We all have come to understand that feelings of anxiety can lead to stress. Over the years I have been helping my clients finding newer and more feasible tools for stress relief. Taking to more easier ways which would perhaps be more coherent and conducive to our modern day environment. Here as a writer I strongly recommend journaling as one of the most effective tools for stress management. As a way to manage stress, journaling needs to be done constantly. By this, I mean, writing every day, your feelings and emotions. The mere expression on paper gives a sense of relief and helps you to rid yourself of your budding anxiety. In order to lead a completely soul-filled, energetic life, giving life everything that you have to offer and being all that you can be, you must keep your soul power (life force) entirely strong and intact. I constantly remind people when I’m teaching that we’re all made up of energy! As energetic beings, we have what’s known as energy cords, which we constantly emanate, whether consciously or unconsciously. When you direct your thoughts and energy to a particular person, place, object, situation, or even an uncompleted project, you begin to establish an energetic cord with whatever you’re focusing on. The more you send your power there or obsess about it, the bigger and stronger the cord becomes. In turn, what happens is that your energy attaches itself to the object of your concern, and your own precious resource seeps away from your soul, where it’s most needed. I’m sure that you’ve heard the expression “giving your power away.” Well, that’s exactly what happens. Not only are you giving it away, which is a form of soul leakage, but you also become energetically entangled once this energy connection has been established. I’m not advocating that you never become attached or that you disconnect yourself from those around you or from life itself. You can have healthy attachments to people, places, and situations, ones that feed your soul and supply you with energy. In other words, I’m referring to anything that’s taking your power away and draining you — the unforeseen connections that pull or tug on your energy, leaving you feeling drained. Documenting a trip makes for a great keepsake, but it can also be a powerful tool for self reflection, turning any journey into a spiritual one. 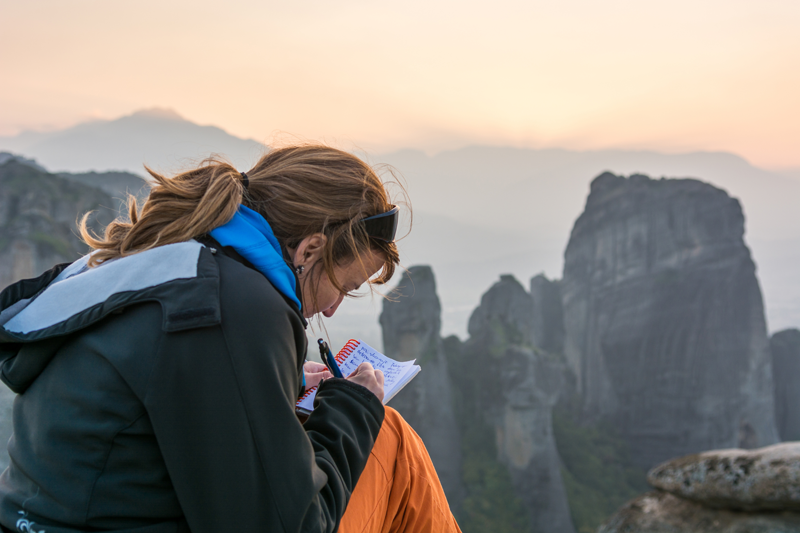 In this article we share 5 Journaling Tips for the Spiritual Traveller. In this blog we share 5 tips to make a meaning travel journal. What do you think of when you think of the perfect creative space? The space where you have the peace and inspiration to write to your heart’s content? I’m not necessarily talking about writing a novel. It can be meditative journaling, creating content for your blog, or even writing a love letter to someone special. Is your perfect spot a sun-soaked beach with the sound of waves creating a thunderous soundtrack? Maybe it’s a coffee shop in the middle of a bustling European city where you soak up culture and sophistication. Or, perhaps it’s a mountain retreat deep in a snow-capped mountain range. Now look out your window. Where are you? Are you in your ideal writing and creating location? If the answer is yes, then kindly go back to what you’re doing and revel in the perfection. I’m sorry to have disturbed you. However, chances are that you’re not in your ideal writing location. Am I right? Your view may be of a dumpster, the neighbor’s swing set, or a front yard that really needs to be mowed. As I approach my birthday and a new year of life, I’ve been thinking about how blessed I am. I’m blessed to live in this country. Blessed to have my family and my friends. Blessed to be in conversation with a loving non-judgmental god. Blessed to have work that interests me. Blessed to be in community with people who are good, kind, compassionate and inspiring. I include you, the readers of The Sunday Paper, as part of that community. Hey friends… As you may or may not know, I have recently published my first book, as a publisher, not as an author: 365 Days of Angel Prayers. I also recently wrote my 20th book. Not all of the books are mine alone. Several are co-authored with amazing people doing similar work, and some are compilation books. Many are self-published by SDJ Productions and several are published through traditional publishing companies. I have learned a lot about witting … and publishing … and self-publishing. I have really gotten to experience many aspects of this industry… and I really love it. I love it because … it might be hard to believe … I was someone who did NOT like to write … not for anything besides personal journaling anyway. But, the message became more important than my dislike or fear … it became a BIG part of my purpose. Which is why I love this industry. It allows us to help others through our experience, it gives you a voice in a different and powerful way, and opens up a healing that I truly believe serves the masses, not just the self. That’s why I have asked Shanda Trofe to share with my readers little tips and tidbits to support you and your writing. To Manifest Your Desires - Rewrite Your Past To Manifest! When you think about your past, what makes the old you that lived your old story and your memory of the experiences come alive? Do certain smells trigger a memory? What about music? A song can remind you of a moment in time where you were changed forever. But were you frozen in time? Do you still tell the old story the same way?